And finally the day arrived that our cameraman Brad had been looking forward to pretty much since he was able to speak – Travelstart’s Epic visit to uShaka Marine World. Well, he had reason to be excited, this was so much fun, it actually hurt! Our first stop was to try out the rides before the coolness of the late afternoon. The rides are an absolute blast! We were shooting down the near vertical “Drop Zone”, lifting off into the air in “The Plunge” and snaking our way at speed down the “Mamba” unfortunately we couldn’t take pics, but, Brad had his sports cam attached to his head, so check out some awesome footage to come in the videos! These rides, if done as many times as we did, you’ll get some seriously stiff muscles from it, but it’s worth it! After that we were off to see a dolphin show. These guys are incredible how they know exactly what to do, on queue and in perfect harmony and sequence, synchronised swimmers could learn a thing or two from these water-bound mammals. They launch themselves out of the water with the greatest of ease and perform some pretty impressive tricks in the water from singing to fetching things and leaping on queue. Its a very entertaining show and you get to be very close them and even get a photo with them afterwards! We moved on to the aquarium next; it’s set inside a mock shipwreck with parts of the interior made to look like they are upside down and in various states of disrepair. Aside from the meticulous attention to detail, the main attraction is the vast array of animals from the sea; there are tanks with big predators to ones with tropical and coral fish, there are even tanks dedicated to jelly-fish and others to lobsters. Everything is kept squeaky clean and the guides are outstanding, each one at each stand had a wide knowledge and passion for their subject matter and our hostess Princess (who does the outreach educational programs to the disadvantaged schools) was no exception, she knew practically everything about every one of the fish, it was truly an enlightening experience! 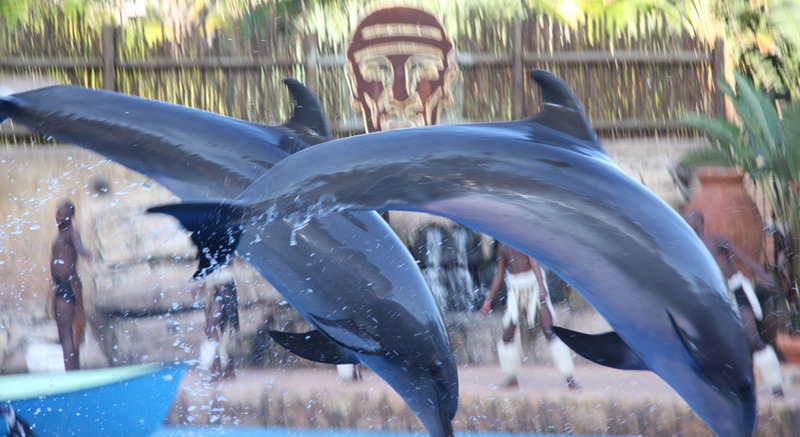 I would strongly recommend a trip to uShaka marine world, there is something for everyone, and you don’t have to take the full package if you only want to do one or two of the experiences. Give them a visit on their website or check out our photos on our Flickr page. Next up, we’ll be experiencing some of the Durban Tourism Indaba and our adventures at Gateway Shopping Centre!